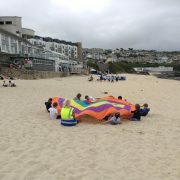 Year 3 visited the beach yesterday morning to mark the end of year 3 with some team games. We played cricket, boules, parachute games and tried out the triple and standing long jumps. However, the highlight of the morning was at breaktime, when a pod of dolphins swam right into shore for us all to see, even jumping above the waves to say hello! What a memorable way to end the term. A big thank you y3 for being such a fantastic team this year. Year 5 took to the sea at Carbis Bay to try their hand at stand-up paddle boarding and we loved it! Although we had some mixed weather for our sessions, this did not dampen our enthusiasm. Not only did we manage to stand up on our individual paddle boards (which is trickier than you think!) we also had a go at some rookie lifeguard training and collaborated as a team to manoeuvre the 8 person paddle board. Lots of us can’t wait to have another go (especially the adults!). 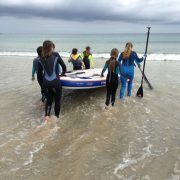 A huge thank you to the Ocean Sports team at Carbis Bay for an amazing experience. Is it a dance? Is it a martial art? Is it a game? Year 6 discovered, in the week beginning 20th June, that Capoeira is, in fact, an energetic, complex, rhythmic mix of all of these and more! Originating from Africa in the 16th century, Capoeira developed amongst slaves in Brazil, who attempted to disguise their martial art as a dance. With music from intriguing instruments such as the ‘berimbau’, ‘agogo’ and drums, year 6 learnt a variety of moves, including the ‘ginga’. Pupils are now busy practising a performance piece, ready the SIJS Carnival on 5th July. 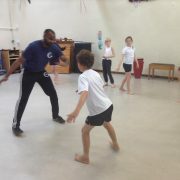 A massive thank you to Josh Kana, Capoeira Master, (www.accornwall.co.uk) from all of year 6! On Monday, Year 4 were delighted to attend a Music Making day at St Ives School, along with pupils from Nancledra, St Erth and St Uny schools. The day started with singing a song written especially for us called ‘Home’. We were so excited as they taught us the harmony parts as well! (We had the high part!) 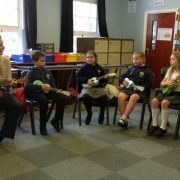 Following this, we each attended one of four workshops, which were Samba, Ukulele, Instrumental and Vocal. After lunch, we used the stage to show each other what we had been practising and we were amazed at the outcomes after such a short amount of rehearsal time! Throughout the day, we were also able to meet the brass and drum instrumental teachers and have a go on the instruments. At two o’clock, we performed to an audience and it was wonderful to see so many of our parents and carers there watching. We all left feeling inspired by what we had seen each other achieve and also by the high standards displayed by the secondary school children who performed with us. It was a great day and brilliant for Year 4 to have the opportunity to collaborate with children from other schools as well as really showcase their love for music. The surf was definitely ‘up’ for 70, very excited year 6 pupils, over the course of the week beginning 15th June. Despite battling with tricky conditions over the course of the week, pupils showed great water safety awareness, huge resilience and a high level of skill. All of year 6 now know whether they are ‘goofy’ or ‘regular’, know the importance of ‘chicken wings’ and are all motivated to go ‘out back’. Hopefully the photo gallery gives you an idea of just what a great learning experience pupils enjoyed. 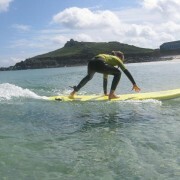 Huge thanks to St Ives Surf School. 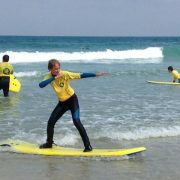 https://www.stivesjunior.org.uk/wp-content/uploads/2016/06/y6-surfing-2016-13.jpg 598 800 Mr Moon https://www.stivesjunior.org.uk/wp-content/uploads/2017/01/New-Website-School-Logo-G.png Mr Moon2016-06-22 11:16:552017-01-20 08:58:14Surf's Up for SIJS! Wow, what an incredible day on the water. 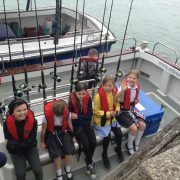 On Friday 10th June, Year 5 took to the seas of St Ives to attempt to catch some fish to use in a traditional Brazilian fish stew. Before beginning our fishing session, we were given a crash course on how to use the rods and by the end we were all experts. Thanks to the experience of Sam and Lewis Narbett and the crew of the Dolly P, we managed to bring back an amazing haul of mackerel (over 60 in total!) as well as a few, very difficult to catch, red gurnard. On our return to school, we had a very messy yet necessary job to complete. Gutting the fish! In preparation for use in the Brazilian fish stew, Mrs Rehaag and most of Year 5 braved the blood and guts of the 60 fish, leaving them clean and ready to be cooked. We can’t wait to get out into the fire pit and put together all of the ingredients for the stew on Tuesday. https://www.stivesjunior.org.uk/wp-content/uploads/ngg_featured/y5-fishing-2016-12.JPG 598 800 Mr Moon https://www.stivesjunior.org.uk/wp-content/uploads/2017/01/New-Website-School-Logo-G.png Mr Moon2016-06-13 11:42:232017-01-20 08:59:09Y5 Go Fishing! 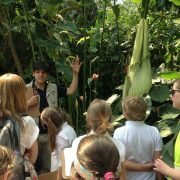 On Tuesday 24th May, Year 4 visited the Eden Project, where we took part in the ‘Rainforest Rangers’ workshop and became qualified Eden Rangers! When we arrived, we had some time to explore the Mediterranean Biome and the outdoor areas. During our workshop in the afternoon, we learned about survival in the rainforest through drama activities, before setting off into the Rainforest Biome to look for plants that could help provide shelter, food and water. This was so interesting! We also really enjoyed walking along the canopy and being above the treetops! At the end of our workshop, we sent our findings to Claire, a ranger working in the Amazon. It was a very enjoyable day for everyone and we all came back exhausted but happy! To launch our Tate Town project we visited Tate St Ives, Porthmeor Studios and The Barbara Hepworth Museum all in one day! Highlights included printing with real fish, losing ourselves in the Hepworth garden and exploring the different ways of showing movement in Art. 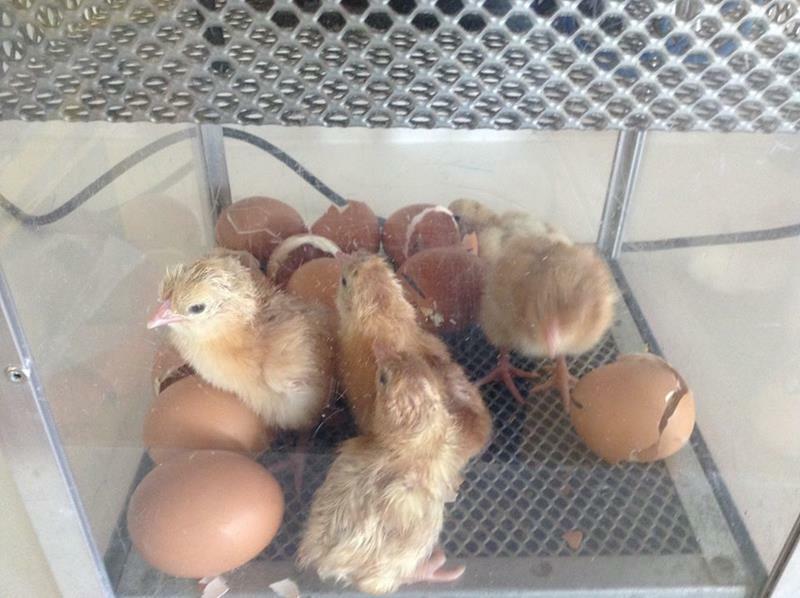 For the last 2 weeks we have had an animal invasion in year 3 with hatching chicks and metamorphosing caterpillars all linked to our habitats learning! We’ve even managed to link maths to habitats and scoured Steeple Woods for a whole range of organisms in different habitats, recording our findings in pictograms. We’d never seen so many Woodlice! Back in school, coaches from Plymouth Argyle FC have been in to help improve our footballing skills. Our competitiveness coupled with great team spirit shone through. On Monday 22nd June, Year 3 visited the Philharmonia’s iOrchestra Truck, which was based at Heartlands. In the iOrchestra Truck was MusicLab, a mobile pop-up play and create experience which allowed the children to become conductors, composers, cellists, percussionists and more! We all had the chance to learn about the orchestra and loved making music with the players themselves! The chorus booth was very popular, and ‘Dancing Queen’ became our ear-worm for the day (the tune that was stuck in our heads)! The children also had the chance to visit the mining museum and park. To kick start our dinosaur topic we were transported back to Ancient Cornwall with the help of Craig, from Squashbox Theatre. Using his puppets, Craig helped us learn lots of new facts about dinosaurs and fossils as year 4 laughed, clapped and squealed with excitement. Additional dino adventures were in the form of Lesley and her life-size Deinonychus and pupils had the chance to explore real fossils from the dinosaur period and study the kind of plants that existed then. The start of our Tate Town project saw us visit The Tate St Ives, Porthmeor Art Studios and The Barbara Hepworth Museum on a fantastic day of learning, which included printing with real fish, observing Hepworth’s distinctive sculptures and studying the art of Cornwall-based artist Bryan Wynter. Learning about the importance of combining ki (energy), kata (body movement), attitude and musical technique, year 4 pupils showed great collaboration skills when learning to perform Taiko drumming with expert Hannah-Jasmine. Year 4 have also enjoyed sporting enrichment and have worked with Chance to Shine cricket coach Roger Hall over several weeks, culminating in an exciting tournament featuring all the Year 4 pupils. Not only that, pupils were delighted to work with Plymouth Argyle Youth Development coaches to develop their skills and compete against each other in a mini tournament. From a mini football tournament with coaches from the Plymouth Argyle development squad, to celebrating Sikh traditions with Daya via some top class surfing instruction with the St Ives Surf School, enrichment activities have well and truly arrived in year 5. We hope the photos give you an insight into our week. Watch this space for more updates. Our enrichment programme started with a coaching session from Plymouth Argyle where we practiced and refined our football skills. The coaches were greeted with both enthusiasm and much excitement and it proved a challenge for them to choose a man or woman of the match. WOW! Surf was definitely up for year 6 this week. Armed with resilience and PMA, we plunged into the sea (literally!) determined to catch as many waves as possible. We stood, we fell, we wiped out all in good humour! The unique experience of Taiko drumming gave year 6 a taste of Japanese culture creating rhythmic patterns and we even learnt some key Japanese words to help us understand the principles of Taiko. Year 6 gave an enjoyable and dramatic performance to the whole school, showing the power and volume of this traditional music from the far East. The Apprentice meets Dragon’s Den is in full swing after the launch of the first ever SIJS Young Enterprise Programme. Beginning with business ideas, pupils have conducted market research to eventually decide on a collaborative business venture. As entrepreneurs, we pitched our ideas in true Dragon’s Den style and each group have now received their initial investment. 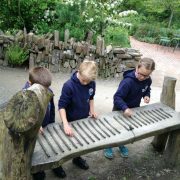 Our creativity and artistic flair were celebrated in Year 6 when we visited the Barbara Hepworth museum and gardens, the Tate Gallery and Porthmeor studios as part of the Tate Town project. At the Barbara Hepworth Museum we explored and studied Hepworth’s works of art and discussed the impact of positive and negative space. The galleries of Tate St.Ives gave us an insight in to a variety of art style from sculptures to optical illusions. The Brazilian artist Rivane Neuenschwander’s ‘I Wish Your Wish’ exhibition consisted of thousands of multicoloured ribbons each stamped with one of 60 wishes that have been gathered from local residents over the last few months. We found this thought provoking and after choosing a ribbon, we wrote our own to be added to the exhibition. The Gyotaku fish printing technique amazed us! We broadened our knowledge of the variety of fish we have in our local waters and then got up close and personal to amongst others, mackerel, John Dory, squid and plaice. Take a look at our art work in the school corridors. For the last two weeks SIJS has been immersed in our Enrichment Week Programme, where we try to provide pupils with more truly memorable learning experiences. If every picture tells a thousand words then we hope we have captured just some of our pupils’ excitement and levels of engagement with the images that follow. Years 5 and 6 took part in some spectacular surf lessons at Porthmeor beach. After learning how to carry the surfboards safely and learning the basics on the beach, we entered the calm waters and perfect waves to practise paddling out and body surfing. We used our ‘chicken wings’ and ‘coat hanger toes’ to perfect our technique. Despite too many wipeouts to count, many of us managed to stand up: future champions maybe!!!! During our enrichment weeks each year group will experience a unique art learning opportunity led by professional artists in their field. Year 3 were visited by the fantastic textiles artist Charlie Lewin, who specialises in making felt. This amazing technique begins with unspun wool and ends with a beautiful, solid felted artwork with lots of hard graft on the way! The Rio Carnival inspired designs were soaked with hot, soapy water then vigorously rolled in a bamboo mat in order to knit the fibres together. 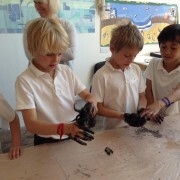 Year 4 spent a day with a local artist Melanie Uys. Taking energising colour and design inspiration from the Brazilian artist Beatriz Milhazes, they created bright and colourful mixed media collages. Year 5 have the exciting opportunity to also work with textile artist, Dena O’Brien, whose specialism is screen printing. Each year 5 pupil has already made simple line drawings along the theme of St.Ives and Cornwall which will be transferred by Dena and her team to screens. When completed year 5 will screen print their designs onto large banners which will then be hung at SIJS events: watch this space! Year 6 will be exploring St.Ives Modernist art through a visit to the Tate St Ives, where they will embark on an artist led activity in the gallery itself. The beats of Brazil came to SIJS when Big Bang Music worked with pupils to create irresistibly catchy Samba rhythms as part of our enrichment programme. Each class had the opportunity to play a variety of samba instruments, from the agogo bells to the huge surdo drums: the challenge was playing them all together in time! The last of the sessions linked to our ‘Shaping Up’ learning, with classes taking part in a musical relay challenge. On Wednesday 4th July, each class in Year 3 and 4 were privileged to take part in fencing taster sessions, led by three-times GB sabre champion Chris Buxton from Truro Fencing Club. Chris has also coached the GB youth team at World and European Championships so we were in all safe hands. After a brief introduction about the history of fencing, the children learnt that the correct stance and footwork is key to fencing success. Wearing the safety clothing of a plastron, jacket, mask and a glove before picking up a foil fencing sword, pupils duelled with skill, showing the expected, courteous respect toward their opponents. Many thanks to Chris for sharing his expertise and well done to the children for taking part so enthusiastically and safely! On Monday 30th June, Year 3 and Year 4 were lucky enough to enjoy a judo taster session led by the Sensei from St Ives Judo Club. Child and adult members of the club, who attended to help make it a memorable session for the children, demonstrated some ‘break fall’ techniques before teaching the children how to do them. Finally, our students all had the opportunity to ‘throw’ one of the adults onto a crash mat. This was the favourite part for many of the children! Many thanks to the members from St Ives Judo Club for coming along to help enrich our curriculum and for bringing the judo mats to enable our children to participate safely. Youth development coaches from Plymouth Argyle visited SIJS on Tuesday to learn with Years 5 and 6, developing skills and running a mini SIJS World Cup tournament for each class. Focusing on cooperation and collaboration, the children warmed up with ‘high fives’ and ‘low tens’ before practising passing skills with partners. Then they were split into four World Cup teams to play against each other, putting the teamwork skills into use. Our children were inspired by the Plymouth Argyle coaches, who kept them on their toes and challenged them to stretch their football skills to the limit throughout the session. Last week, Nathan from Rollers Roller disco St Ives swept into SIJS and provided everyone at St Ives Junior school one of the most memorable afternoons they have had this term! Each session lasted an hour and flew past in a whirl of whole group participation games and choreographed skating that was all done to some high energy music. There was heaps of EOF (energy, openness, focus) on display over both days and everyone kept a great positive mental attitude when skating. There was something for everyone and while our more experienced skaters were quickly able to express themselves, those who were not yet confident skaters soon found their feet and picked up the pace.